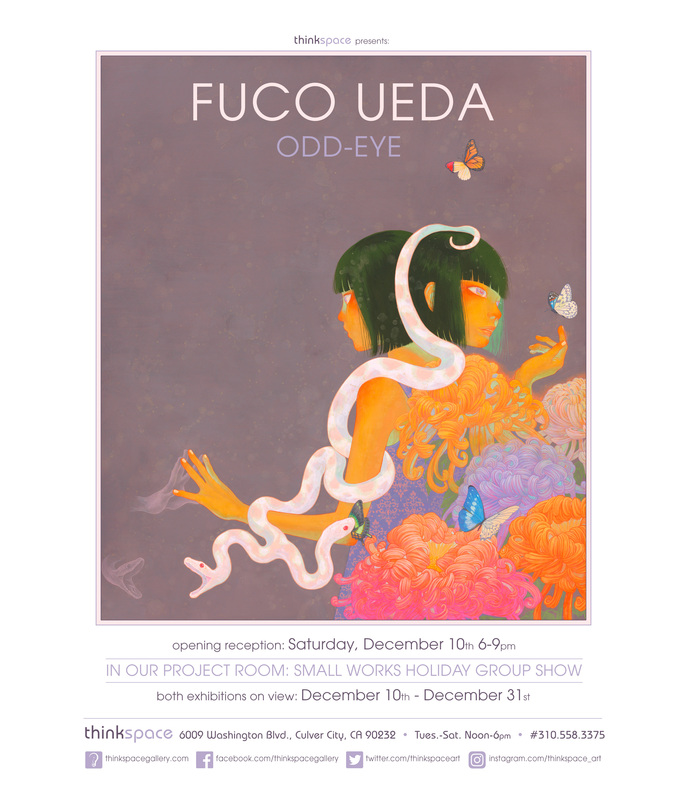 Thinkspace is pleased to present its second solo exhibition of works by Japanese artist Fuco Ueda in Odd-Eye. 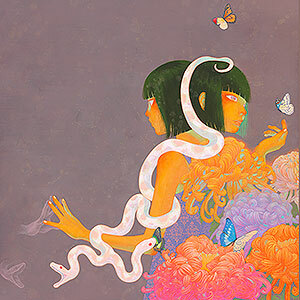 The Tokyo-based Ueda creates surreal paintings of enigmatic girls in strangely beautiful incandescent dreamscapes. With larger than life flowers and creatures ranging from moray eels to butterflies, her paintings are like apparitions pulled from the shadowy depths of the subconscious. Her mischievous adventurers are innocent and devious, at times playful and others sinister, suspended somewhere between the waking world and the beyond. An inscrutable universe of lush neon chrysanthemums and florid skins, Ueda’s world is a hallucinatory daydream. Working primarily with acrylic paints and powdered mineral pigments on canvas, paper, and wood, Ueda dilutes her acrylics to create the consistency of watercolor. The unique quality of her surfaces is both chalky and luminous owing to this technique. Self-admittedly, Ueda is personally attached to her works, and her process is ultimately tantamount to a loss, preparing each for release into the world with the sprinkling of water as an acknowledgment of its completion and passing. We are left with the sense that Ueda’s world is in a constant state of transition and contraction, emerging and receding through the stitches of tenuously bound worlds.